Pro-Series™ sand systems are designed and equipped to offer the ideal combination of energy efficiency and outstanding water clarity. A broad selection of filter sizes, pumps, and accessories allows you to choose and merchandise the system(s) that best suit your above-ground pool program. For above-ground pools, XStream® cartridge filters systems provide a massive filter body for added capacity of dirt and debris and longer, more efficient filtering cycles. 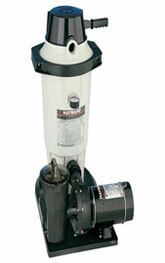 Its massive size and incredible performance mean years of trouble-free filtration. Quick release, high capacity air relief valve. 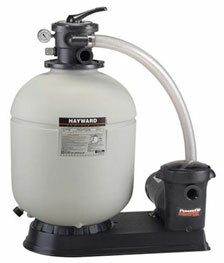 Glass reinforced, non-corrosive filter tank will provide years of trouble-free operation. Easy-Lok ring design allows quick access to all internal components in a single turn. Unique safety catch prevents over-tightening of the lid and efficiently secures the filter for high performance operation. Longer and more efficient filtering life. 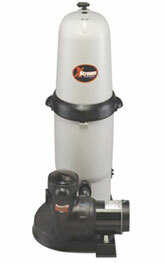 Larger filter body ensures an equal distribution of dirt and debris throughout the filtering element.